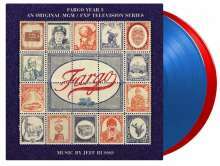 Der Artikel Filmmusik: Fargo Season 3 (180g) (Limited-Numbered-Edition) (Red & Blue Vinyl) wurde in den Warenkorb gelegt. Fargo is a multiple award winning black comedy-crime drama anthology television series created and written by Noah Hawley. The show is inspired by the 1996 film written and directed by the Coen brothers, who serve as executive producers on the series alongside Hawley. It follows the lives of a couple who become involved in a double murder case. Thanks in part to a memorable dual performance from Ewan McGregor, Fargo Year 3 maintains the sly wit and off -kilter sensibility it displayed in its first two seasons. There are few shows that use music better than the haunting score of Fargo, written by Jeff Russo. He has become a prominent composer, songwriter and arranger in the film and television industry. About his work on the series, the composer said: »Writing for Fargo has allowed me to push the envelope creatively. It's a composer's dream job to be tasked with creating themes, motifs and melodies for such interesting and deep characters with such incredible stories«.